The beauties are perfect for Fall. Copper is hand formed into leaf shape. Pigmented vitreous enamel (powdered glass) is sifted and fired in kiln at approximately 1460 degrees Fahrenheit. The process is repeated multiple time on each side. The sides are filed and buffed. 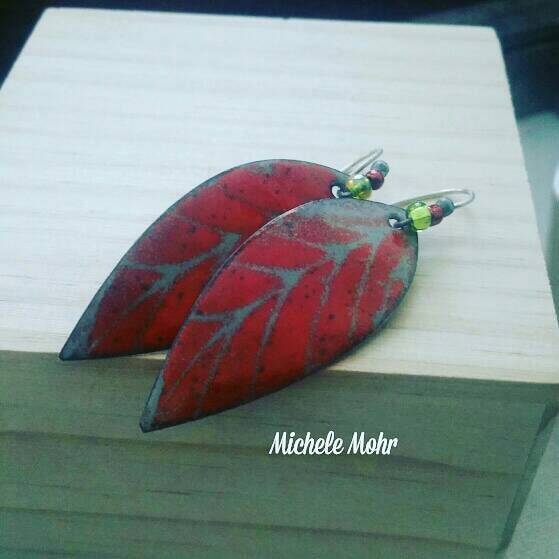 The leafs are then attached with green and reddish orange glass beads to oxidized handcrafted ear wires which were fired with torch to make small silver balls on end, hand formed, hammered and ends filed. They are then oxidized with liver of sulfur and sanded to give rustic oxidized color. Packaged safely in a cotton filled gift box. Ready for gifting. The leaf is approximately 2" in length and .75" wide. Approximately 2.25" in length including ear wire.